Best. Sonoma County Restaurant Week. Ever. After six years of trial and error, the more than 100 regional restaurants participating in this year’s Sonoma County Restaurant Week (March 7-13, 2016) have dialed it in with great meals at great prices for 2016. I’m more impressed with the lineup this year than I’ve ever been before, perhaps because restaurateurs have discovered that the event can be a huge economic boon during the quiet winter season. Now that the economy has turned around, locals are getting into the groove of the annual event, which also helps considerably. If this is your first rodeo, here’s the deal: Participating restaurants offer prix fixe menus throughout the week with prices of $10 and $15 for lunch; $19, $29 and $39 for dinner. It’s a great way to try out a new spot or get a great deal at a favorite restaurant, and the range of prices means there’s something for every pocketbook. A dietary note: Most of the menus include vegetarian options, but if you have specific dietary needs, it’s a good idea to contact the restaurant in advance. After perusing the menus posted at the Sonoma County Restaurant Week website, we’ve pulled out some of the best bets in terms of overall value, menu and our own experiences at the restaurants during the other 51 weeks of the year. The $15 lunches and $29 dinners seem to be the sweet spot for the most choices, though the $39 dinners are a steal at some of Sonoma County’s swankier eateries. This list doesn’t include everyone, so if you don’t see a fave, the restaurant may now have posted a menu, or the cost-to-deliciousness ratio just didn’t rank high on our radar. Since we haven’t tasted each menu, we can’t promise these will all be winners, but it’s certainly a solid place to start. Also, make sure to check out the Sonoma County Restaurant Week website to find hours, since some restaurants are closed Monday and Tuesday. 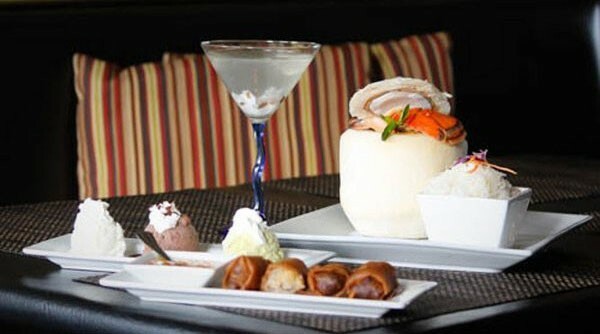 $10 Lunch Best Bet, Pongo’s Kitchen and Tap: Crispy rolls with sweet sour plum sauce; coconut filled with red curry, lobster, prawn, calamari, scallops and mussels served with steamed jasmine rice; ice cream sampler. 701 Sonoma Mt. Parkway, Suite C8, Petaluma. $15 Lunch Best Bet, Backyard: Wild mushroom soup with creme fraiche and salsa verde; buttermilk fried chicken sandwich (or bacon, lettuce and kimchi sando); candy cap mushroom ice cream. 6566 Front St., Forestville. Chef John and Gesine Franchetti of Franchetti’s Wood-Fired Oven, Events and Catering. La Rosa Tequileria: Octopus tostada, carnitas torta, Mexican chocolate mousse. 500 Fourth St., Santa Rosa. Canneti Roadhouse: Pork shoulder with baked beans and herbs, crispy chicken over fava pesto with pasta and Pecorino cheese. 6675 Front St., Forestville. Sazon: Peruvian empanadas, Adobo (braised pork) sandwich with fried sweet potatoes. 1129 Sebastopol Rd., Santa Rosa. $19 Dinner Best Bet, Barley and Hops: Seared scallops with basil and lavender vinaigrette, herb and almond crusted hangar steak with Brown Nectar Ale sauce, sea salted chocolate eclair. 3688 Bohemian Hwy, Occidental. La Vera Pizza: Carrot, coconut, curry, cilantro bisque; sweet potato gnocchi with gorgonzola sauce or red potato pizza, sea salt caramel hazelnut cannoli. 629 Fourth St., Santa Rosa. Bear Republic: Minestrone soup, bite-sized sliders (Jamaican jerk, bbq pulled pork, black and blue burger) or Brewers’ mac and cheese, Beer-a-misu. Same menu for lunch. 345 Healdsburg Ave., Healdsburg. Hopmonk: Sausage board, meatloaf with mashed potatoes, three chocolate tart with strawberries and whipped cream. 691 Broadway, Sonoma. Union Hotel: Caesar salad, chicken mushroom marsala or homemade ravioli, chocolate mousse cannoli. 280 Mission Blvd., Santa Rosa. Taverna Sofia: Dolmas with tzatziki, moussaka, baklava. Open Thursday through Sunday. 244 Healdsburg Ave., Healdsburg. Petaluma Pie Co.: Dinner for two includes 2 veggie or meat pies, salads and a mini pie to share. 125 Petaluma Blvd. No, Petaluma. Palms Grill: Caesar salad, filet mignon with mashed potatoes, lemon meringue pie. 18999 Sonoma Hwy., Sonoma. City Limits Restaurant: Calamari with chipotle aioli, braised short ribs, J.M. Rosen Cheesecake. 5151 Montero Way, Petaluma. $29 Dinner Best Bet, Earth’s Bounty Kitchen: Spice-crusted ahi tuna with lemon aioli; herb-marinated beef tenderloin; beignets with vanilla cream and chocolate sauce. 5755 Mountain Hawk, Way, Santa Rosa. Bistro 29: Roasted carrot and ginger soup with brown butter pears, Rosie chicken leg “au vin” with potato puree, apple gateau Breton tatin with salted caramel. 620 Fifth St., Santa Rosa. Charlie’s at Windsor Golf Club: wild mushroom and chicken crepes, panko-crusted chicken filled with spinach and mozzarella with creamy tomato sauce, chocolate waffles with ice cream, maple peanut butter sauce and whipped cream. 1320 19th Hole Dr., Windsor. Piacere: Barbecue oysters, soup, lobster ravioli with orange cream sauce, homemade tiramisu. 504 N. Cloverdale, Cloverdale. Peter Lowell’s: Vegetarian option: roasted chicikories with live, caper and burrata, linguine with black pepper and Pecorino romano, vegan chocolate chip cookie sundae. (But the butterscotch budino with bourbon caramel and whipped cream is pretty amazing for a omnivorian splurge). 7385 Healdsburg Ave. #101, Sebastopol. Cafe Lucia: Tasca tasting appetizer, slow braised beef shortribs, salted chocolate tart with caramelized banana. 235 Healdsburg Ave., Healdsburg. Willow Wood Market Cafe: Asparagus soup or baked goat cheese, Italian meatballs with polenta, lava cake. 9020 Graton Road, Graton. $39 Dinner Best Bets, Valette: French onion soup with 64-degree egg and prosciutto; honey brined pork chop with brown butter parsnip mousseline; chocolate mousse with sea salt. Dinner starts at 5:30p.m. 344 Center St., Healdsburg. Hazel Restaurant in Occidental. Photo Heather Irwin. Hazel Restaurant: Lamb meatballs; pork schnitzel; Hazel Sundae. 3782 Bohemian Hwy., Occidental. Dry Creek Kitchen: Niman Ranch pork belly with white bean puree, pan-roasted pork loin, “the” peanut butter bar. 317 Healdsburg Ave., Healdsburg. Mateo’s Cocina Latina: Asparagus soup, beef steak with celery root, braised onions, Downtown Bakery sticky bun and flan. 214 Healdsburg Ave., Healdsburg. French Garden: Ahi poke, McFarland’s Springs trout, chocolate pudding with mini chocolate brownies. 8050 Bodega Ave., Sebastopol.